We are offering Infant Warmer Aoma - 1000 Bc to our clients. Microprocessor based design, clear large display, scan mode operation, programmable alarm mute time, automatic over-heat and over temperature protective system, Infrared heater, servo-manual mode operation, integrated bed with up-down tilting facility, storage cabinet withdraw, IV pole, Pump mounting pole, monitor tray, Halogen lamp for observation, swivel heater unit, PT 100 Temperature probe, Interchangeability (Calibration not required), Accuracy +/-10 Deg C, Set Temperature range 30-38 deg C, Alarm for temp-low, Temp-high, probe failure, power failure, system failure, Heater power rating- 600w/Halogen lamp-50w,The distance of heater source to baby 85 cms, indication of heater output percentage, time-on/time-off,transparent acrylic panels, on swivel casters. Established in the year 1999, we, Goodhealth Inc., are known for manufacturing, supplying, wholesaling, trading, exporting and importing an extensive array of the finest quality of Medical Instrument. The product range offered by us is inclusive of Hospital Furniture, Surgical Consumables and Diagnostic Equipment. 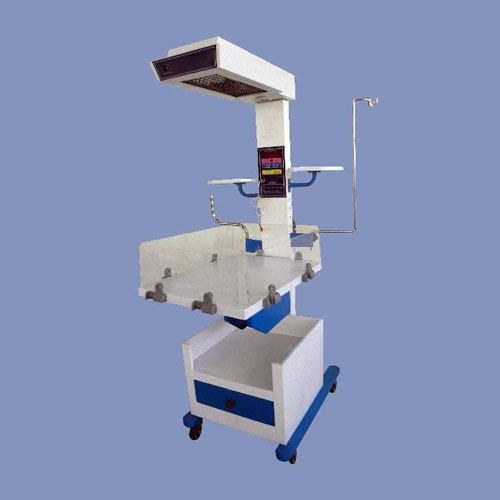 Designed as per the medical industry set norms and regulations, the offered range of equipment and machines is used in hospitals, medical centers, nursing homes and health clinics. With the aid of their accuracy in analysis of different results, user-friendly operation and sturdy construction, the offered diagnostic machines are highly appreciated among our patrons. Boasting on a very congenial working environment, we work to attain maximum customer satisfaction. We have been able to cater to the precise needs of our valuable patrons, owing to the ability to manage bulk orders, customer centric approach, ethical business polices and different modes of payment. Command Army Hospital (R&R Hospital) and Medical Superintendent Safdarjung Hospital are some of our valuable patrons who are associated with us over a long period of time. Our Importing / Exporting Countries are Israel, US, Norway, Australia, South Affrica.